according to research, evidence-based practices (EBPs) are the most effective. Evidence-based practice means that clinicians are using procedures that have been studied carefully and those results have been reviewed and published. One reason for using EBPs is because, by law in many countries, teaching practices must be based on evidence of effectiveness. The National Professional Development Center on Autism Spectrum Disorder (NPDC) determined if an intervention was effective through a review of peer-reviewed research in scientific journals. 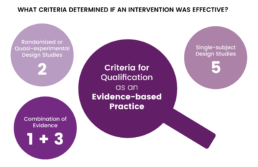 An intervention was considered to be an evidence-based practice if it met the specific criteria outlined below. One high quality randomized or quasi-experimental group design study and at least three high quality single subject design studies conducted by at least three different investigators or research groups (across the group and single subject design studies).